Kindle loves this project because... having Laura Loescher on our team to help us shepherd this exciting new project into the world, means we’ll get to share what we’ve learned, hear what others have to teach, and create community and tools for Indie Philanthropists. At Kindle, we’ve been practitioners of Indie Philanthropy since we began in 2008, before we even knew it had a name. Last year at our strategic planning retreat with our Steering Committee, the idea to launch the Indie Philanthropy Toolkit was born. Excited to collect stories, styles, resources and networks of interested parties, we’ve been getting our hands dirty with research, writing, conversation and exploration to launch this project in October 2014. We were thrilled when Philanthrogeek founder, Nathaniel James invited Kindle consultant, and longtime friend and advisor, Laura Loescher to write about Indie Philanthropy on his website. The article below, (originally published here), is a wonderful introduction to Indie Philanthropy and the kinds of subjects and themes we will be exploring with this new project. A big thank you to Laura for planting the seeds of this Toolkit with this article. Her wise words and apt insights are making sure that this project will serve those who need it most—Indie Philanthropist practitioners and those interested in out-of-the-box giving. We can’t wait to share the Toolkit with you next year. Until then, learn more by reading Laura’s article below. A big thank you to Philanthrogeek as well—a great site and resource for those interested in great articles, research and information on social giving. Are you an Indie Philanthropist? Through my twenty-year career in philanthropy and social impact investing, I’ve had some amazing sandboxes to play in with my colleagues and co-creators—continually experimenting and innovating at the outer edges (and sometimes jumping out of the box entirely!). Over the years, in various roles, I’ve collaborated with others to promote community-based philanthropy, engage with Flow Funding, design giving circles, fund start-ups, back crowdfunding campaigns, and participate in micro-granting programs. It’s only very recently that I discovered a term that captures the spirit of what my playmates and I have been up to all these years: Indie Philanthropy. The term Indie Philanthropy came out of a dynamic strategic planning process that I was a part of with Kindle Project, an unconventional philanthropic organization that I’ve been advising since it began in 2008. Kindle Project was looking to define the spirit and action of what they were doing, and what they saw others in the field experimenting with as well. Similar to how Indie Films are produced outside of the major film studio system and often have unique style and content, Indie Philanthropy operates outside of traditional philanthropic models. It encompasses a range of practices, structures and attitudes rising from rapidly changing economic, cultural and collaborative contexts. Indie Philanthropy can be identified by HOW funding is done, by WHAT is being funded, and by HOW impact is measured. 1) Experimentation and Innovation: risk-taking is respected and “failure” is part of learning, evolving and becoming more effective. 2) Trust and Balance in Relationships: the quality of relationship and communication between donors and grantees is emphasized and cultivated, and power imbalances are diminished. 3) Collaboration: partnership and sharing on many levels is valued and integrated into the funding process. 4) Empowerment and Responsiveness: grantees are encouraged to set their own priorities, define success for themselves, and shift course if useful to adapt to changing circumstances or information. Anyone involved in mainstream philanthropy – whether on the funder or grantee side – knows that these themes contrast pretty dramatically with some of the more conventional philanthropic structures, systems and practices. Why is Indie Philanthropy important? In these times of rapid change and global crisis, the health of our planet, communities and systems depends on creative, collaborative solutions from the ground up. Many of these solutions are emerging from individuals and communities that are not part of formal nonprofit organizations or who don’t have access to mainstream foundation dollars. Traditional philanthropy is often not reaching leading edge thinkers, activists and change-makers. Indie Philanthropy represents a positive disruption to this status quo—its practices are complementary to mainstream philanthropy, providing much-needed diversity, creativity and risk-taking to the broad field of philanthropy. Through crowdfunding, micro-granting, giving circles, flow funding, individual awards, community partnerships (among other Indie styles) Indie Philanthropy creates opportunities for diverse and innovative impacts by directing resources to people and projects that wouldn’t otherwise have access to philanthropic dollars. Some styles of Indie Philanthropy are also way more accessible to would-be donors – someone with $25 to give can participate as fully as someone with $25,000 to give. Indie Philanthropy is dynamic and continually evolving—responsive to the rapidly shifting landscape of change-making activities and offering resources in ways that can best serve the needs of cutting edge work. Many Indie Philanthropy practices help build trust and create healthy, collaborative relationships between donors and grantees. While this can be more fulfilling for everyone involved, it’s also strategic—trust is essential for effective rapid response funding, for developing long-term partnerships, and for appropriate course corrections when circumstances change. This is just one example among many experimental Indie Philanthropy approaches seeking to support and nurture truly important (but perhaps overlooked) ideas and actions that could make a real difference (in this case at the local level) in changing the direction of the alarmingly destructive course we are on with regards to environmental degradation, economic inequality and human rights disasters. 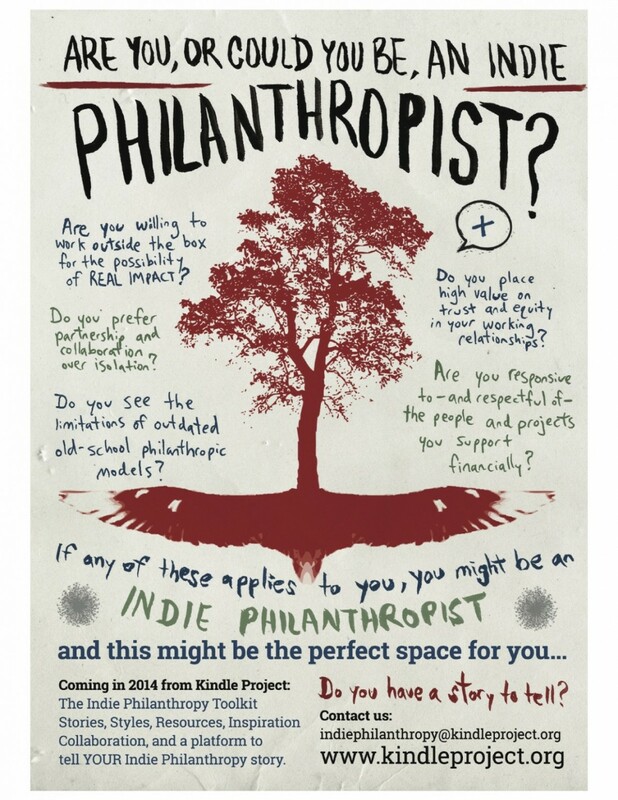 I’m also collaborating with Kindle Project and others to create on online resource for people interested in learning about and implementing Indie Philanthropy. This Indie Philanthropy Toolkit will include examples of a wide range of Indie Philanthropy approaches, complete with definitions, descriptions, stories and instructions. We would love to hear from you if you know about, or are involved with, an Indie Philanthropy project that you think should be featured in the Toolkit. Please email us at indiephilanthropy@kindleproject.org. We plan to launch the Toolkit in the Summer of 2014. Indie Philanthropy provides an opportunity for many people across the social and economic spectrum to contribute to emerging alternatives for personal, collective and planetary wellbeing. If you’re not already playing this game, I invite you to join the fun! Indie Philanthropy postcard design by Luke Dorman. Laura Loescher is a leadership coach, philanthropic advisor and a guide to individuals and organizations who are devoting their lives and resources to inner and outer healing and transformation. 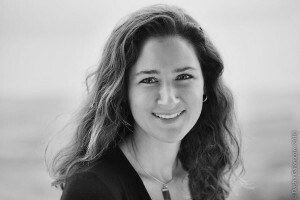 A renowned philanthropic leader and innovator, Laura previously co-founded and directed Aepoch Fund, a foundation supporting artists, healers, activists and movements engaged in transforming ecological, cultural, economic, and social conditions so that all people and the planet can thrive. Prior to that, she co-founded and directed Changemakers, a foundation practicing and promoting community-based philanthropy and organizing donors to direct their giving to social change. She has designed and facilitated trainings, workshops, and curricula related to personal development, philanthropy and social change for audiences around the country. After nearly two decades living and working in San Francisco, she recently moved to tranquil Ashland, Oregon with her partner Saleem Berryman.